TruQC 5.0 is now available for download in the App Store and Web App 2.0 is now accessible at app.truqc.com. This new release includes additional features to Issue Tracking, including a new Issues tab! This version of TruQC is compatible with iOS 10 or higher. 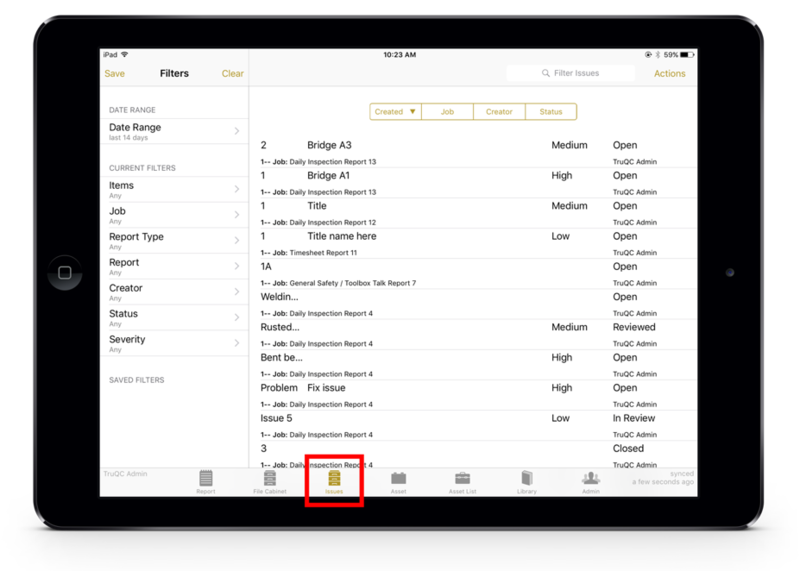 New Issues tab on the iPad and Web allows you to view, filter, sort and administer issues independently of the report to which they were added (via the Issue annotation tool on a report’s Associated Documents). Expanded data entry options for Issue annotation, including Title, Severity, Status, Review note and optional NDT fields. When approving a report, you’ll have the option to mark all issues, only if there are any, as Reviewed. Push notifications enabled for saved filters on Issues. New tools for making local caching easier and faster, for offline access and administration. New line tool annotation for straight, adjustable lines on documents. New multi-select ability for importing from the Photo Library. New VIN barcode scanning section. Approval signature modal now includes a Comment and Next Inspection Date field. As always, other tweaks and fixes. To Update: Tap the blue App Store icon on your home screen. Search for “TruQC” in the search bar, then tap “Update.” TruQC 5.0 will then begin to install. Once complete, you will be prompted to log in once again. TruQC will only be compatible with iOS 10 or higher. Check out our YouTube channel for tutorial videos. Let us know if you have any questions or would like to schedule a refresher training by emailing us at support@truqc.com or giving us a call at 1.866.488.4170. Visit the TruQC Web App to access TruQC on a desktop or mobile device.